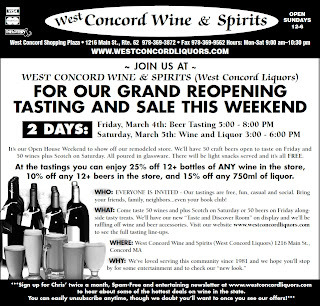 West Concord Wine & Spirits is having a Grand Reopening tasting this Saturday March 5th, 2011 from 3:00 pm to 6:00 pm. They'll be offering 25% off a mixed case and pouring 50+ wines along with light snacks. For more info including a list of the wines being poured along with discount pricing click here.